This month, the African Union’s Peace and Security Council was supposed to make a field trip to Burundi. The idea was that an on-the-ground intervention might just alleviate the political crisis and ward off further violence. But the trip didn’t happen, and presidential elections went ahead on Tuesday. The PSC REPORT examines why the council stayed in Addis Ababa, and whether they could really have made a difference. In July, the Peace and Security Council (PSC) was scheduled to leave its Addis Ababa headquarters and get closer to one of its most urgent situations: Burundi. However, the trip has yet to take place, largely because of logistical problems and the fact that it could have been seen as an endorsement of President Pierre Nkurunziza’s third term bid. Presidential elections in Burundi went ahead yesterday, 21 July, but the question remains: could a timeous visit from the African Union’s (AU’s) most influential institution have lowered the potential for violence? According to the first draft of the PSC programme for July, the PSC was to undertake a field mission to Burundi from 24–26 July, pending consultation between the AU Commission and Burundi. In a later version, these dates were altered to 18–20 July, as apparently confirmed by Burundi through a diplomatic note. The provision for a field trip in July came as no surprise. At the 25th AU Summit in Johannesburg in June, the incoming PSC chairman for July indicated he thought it was important for the PSC to engage more directly with the situations that fall under its remit; that PSC members need to see what is happening on the ground. According to sources, South Africa’s ambassador to the AU, Ndumiso Ntshinga, said he wanted to use his chairmanship to make that happen, and several options were discussed, including Burundi, the Central African Republic (CAR) and the eastern Democratic Republic of the Congo. PSC field missions are not a new phenomenon, although they do not happen very often. The last field mission was a visit to Mali with the European Union Political and Security Committee in February this year. That mission met various government figures, including President Ibrahim Boubacar Keita, as well as representatives of key political parties, parliamentarians and civil society organisations. To their credit, participants travelled from the capital Bamako to the city of Gao, a focal point for violence and instability in northern Mali (although, for security reasons, they were not allowed out of the airport). However, the Burundi field mission did not take place as planned, due to a combination of factors. According to sources, the South African delegation was slow to process the diplomatic formalities associated with the trip, while Burundi was reluctant to confirm dates and a detailed itinerary. Complicating things further was the postponement by one week of Burundi’s presidential elections, to July 21, which would have meant that the PSC would have arrived in Bujumbura while campaigning was in full swing; and the involvement of a number of PSC delegates in the Third International Financing for Development Conference in Addis Ababa from 13–16 July. It is also important to note that Burundi is a member of the PSC and its former ambassador to the AU, Alain Nyamitwe, was appointed by Nkurunziza as the country’s new minister of foreign affairs in May this year. The appointment came amid growing concern about the situation and street protests against the government in Bujumbura. Tanzania and Uganda, both important actors in the attempts to find a solution to the crisis in Burundi, are also members. Uganda took over from Tanzania as mediator earlier this month. Taking all this into account, the PSC decided to postpone the field mission to an unspecified date (a representative from the Burundi embassy said that it was unlikely to happen in July, if at all). The decision came much to the relief of the AU Commission, which had been concerned about the expense associated with the proposed mission, and nervous that the PSC’s visit could be perceived as an endorsement of Nkurunziza and the controversial electoral process. These concerns reflect larger questions about the utility, or otherwise, of field missions. While in principle a good idea, it is often hard for diplomats – bound by tight security restrictions – to penetrate beyond the layers of protocol and propaganda. How much can a brief field mission really alter one’s understanding of a country’s complex political dynamics? And what impact would it have on the PSC’s decisions? To answer these questions and others, the PSC Report turned to deputy executive director and director of research at the Security Council Report Joanna Weschler. The United Nations (UN) Security Council goes on regular field missions, and has been doing so for decades (Coincidentally, the UN Security Council’s most recent field trip was to Burundi in March; this was the final leg of a trip that also took in the CAR and Ethiopia). The UN Security Council’s experiences, and lessons learned, are directly applicable to the PSC. In fact, the UN Security Council’s field missions may have inspired the PSC to do the same. ”The UNSC does regularly visit countries that are identified as flashpoints … What we are urging for is adherence to co-operation between the African Union Peace and Security Council and the United Nations Security Council as we have had two [UN] resolutions under the chairmanship of South Africa that emphasised the importance of this,” South African Minister for International Relations and Co-operation Maite Nkoana-Mashabane said at a press briefing in Pretoria on 15 July when asked about the PSC field trip to Burundi. The UN Security Council’s field missions have evolved over the years, and not necessarily for the better. In the past, any member could propose a trip, and the chairman could delegate who would go – it was not necessary for the whole council to participate. Trips could also be organised quickly, at a few weeks’ notice, allowing the council to respond to developing and emergency situations. Now, the full council is required to participate, making field missions large and unwieldy, and the permanent members tend to dictate the agenda. “Security Council field missions have gone through a range of mutations. Nowadays they are not extremely useful; it is essentially high-level tourism. They are still useful for people who have never been to a continent they are dealing with. It helps to get a better perspective on the levels of misery and the impact of those resolutions they adopt. But it is essentially very passive right now and usually extremely delayed in terms of when it can make a difference,” explained Wechsler. For Wechsler, a good field mission is characterised by timeliness and a clear strategy. One example is the September 1999 mission to East Timor, in the midst of post-referendum violence, where the UN Security Council played an important role in mediating between belligerents and contributed to a reduction in violence – saving lives in the process. “This is an example of a useful mission, because it’s a crisis, it’s an urgent situation. What really makes sense is when the council can interact with key actors and send very strong messages. It’s done face to face but it is also done through being seen in the media and in being present in the place in question. These things actually do help,” she said. This article first appeared on the PSC Report, a publication of the Institute for Security Studies. 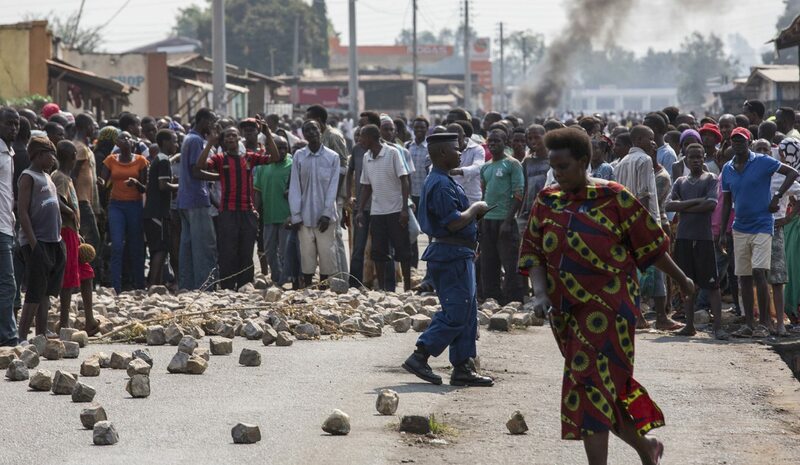 Photo: Protestors block a road in protest after they discovered the body of a man, whom they believe was an opposition party member, in the Nyakabiga neighborhood of the capital Bujumbura, Burundi, 21 July 2015. Burundians were voting 21 July in a controversial presidential election, boycotted by the opposition and marred by violence. Witnesses reported gunfire and grenade explosions overnight. A police spokesman declined to immediately comment on reports that a police officer and a civilian had been killed in clashes. EPA/WILL SWANSON.